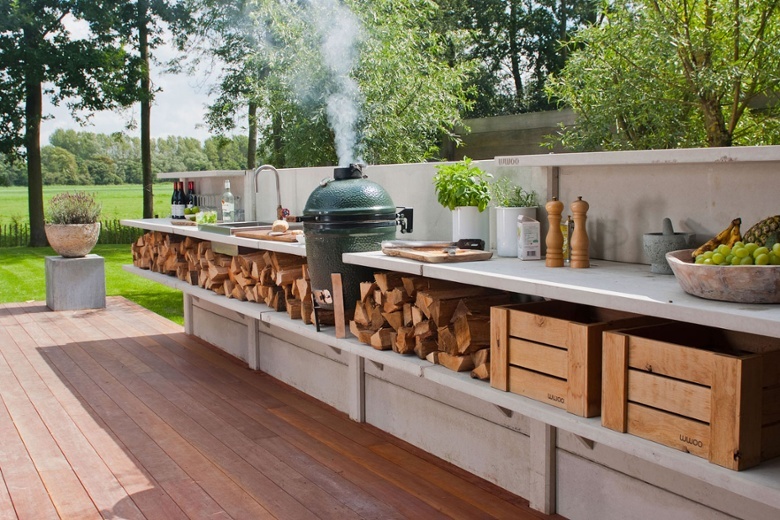 Building an outdoor kitchen may seem like a luxury only millionaires and celebrities can afford, when in fact, you too can cook, eat, and socialize in the great outdoors. 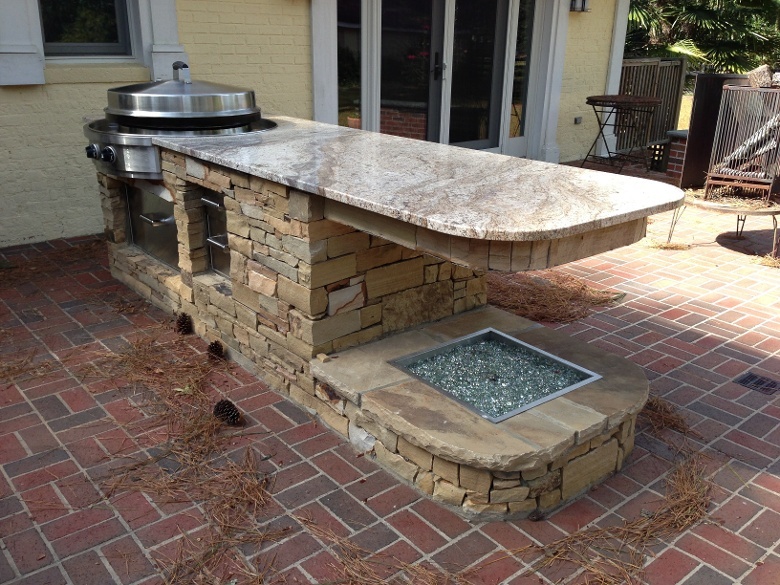 Here are six affordable outdoor kitchen design types and which stone countertop material to use to ensure your kitchen remains beautiful and functional for years to come. If you live in an area with variable climate (*cough* Chicago *cough*), having a covered outdoor kitchen means you can keep the party going no matter what nature brings. Covered outdoor kitchens also mean your appliances and countertops will show less wear over time due to reduced exposure to the elements. 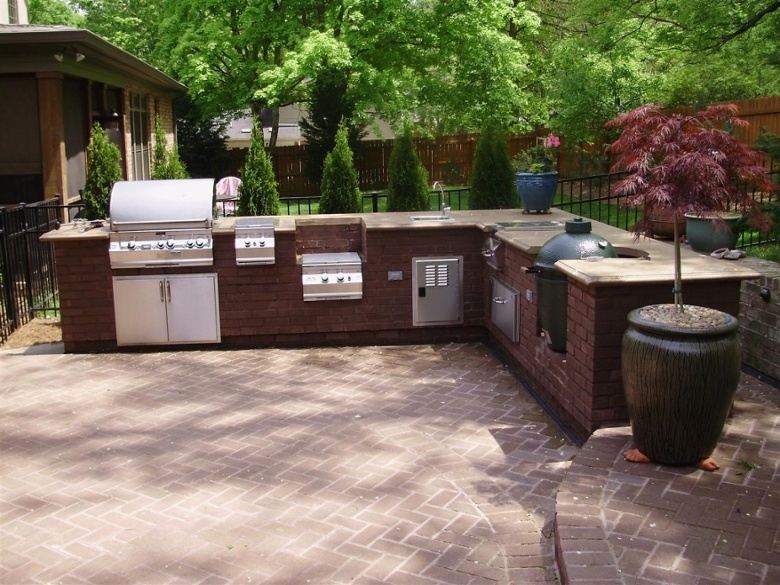 Chances are, if you’re thinking about constructing an outdoor kitchen, you like to be outdoors. Soak up every bit of sunshine you can with an uncovered kitchen design. Short on space but still want to be the summer “party house”? This set up allows you to incorporate the kitchen essentials without consuming too much square footage. 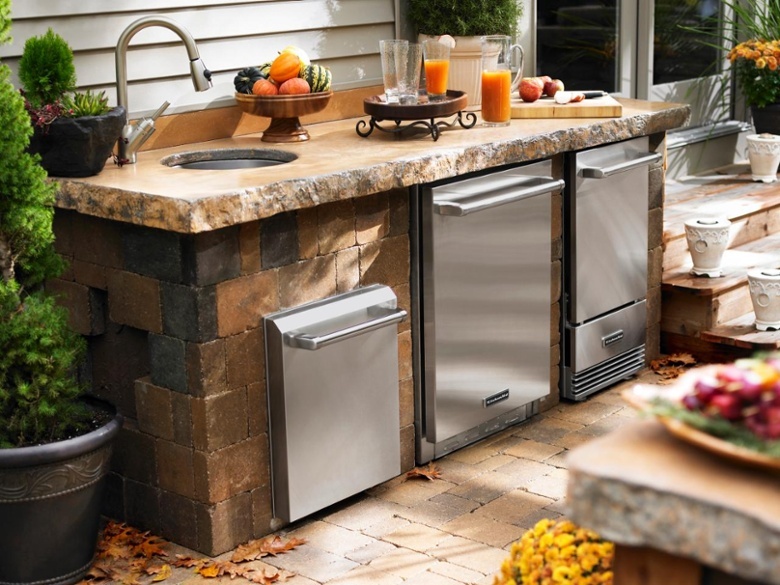 If you’re not interested in cooking, but still want to celebrate outdoors, try adding a drink bar with refrigerators for wine and beer. Want to get a little fancier? Include an icemaker so the party can continue into the heat of summer. Perfect for people who like to cook grand summer meals for their family and friends, a long prep station allows for multiple cooks in the kitchen without the claustrophobia that comes with cooking indoors. 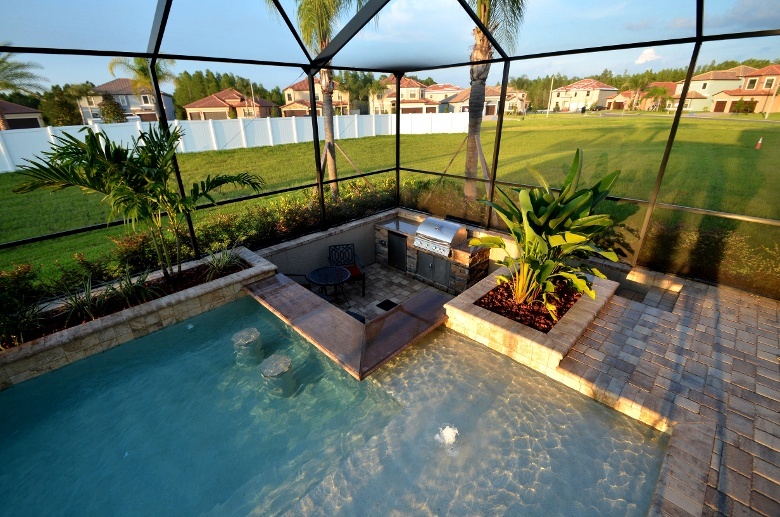 The height of luxury, if you have a pool and you do not have an adjacent sunken kitchen, you are missing out on an amazing opportunity. 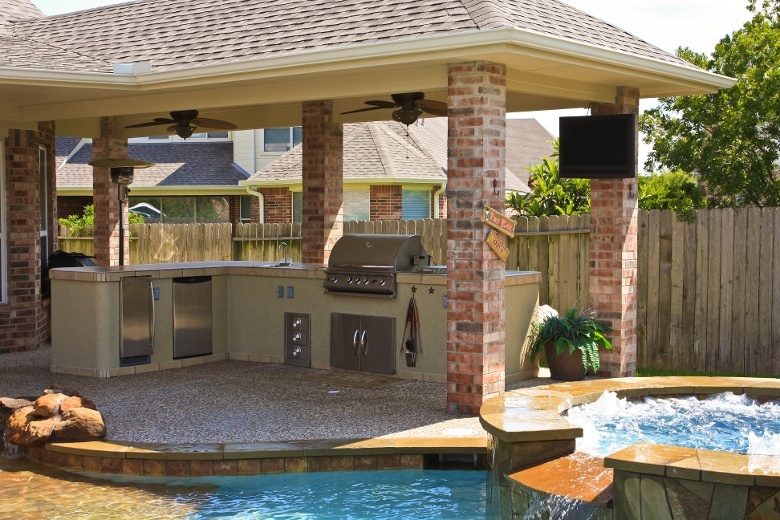 Imagine swimming up to your outdoor kitchen and enjoying a summer meal without having to get out, dry off and cover up to enter the house and eat. Granite is very durable and resistant to heat and scratches, making it a prime choice for any kitchen. We do not, however, suggest granite for uncovered outdoor kitchens because the exposure to sun and rain will result in visible wear and tear of the natural stone over time. Quartz is perfect for outdoor kitchens. Because it is manmade and designed for durability and low maintenance, quartz can be used for both covered and uncovered outdoor kitchens. We do, however, suggest you keep the color selection to the more neutral colors, especially if you kitchen is uncovered to reduce the chances of the color changing due to sun exposure. Cambria is stronger than Granite and is one of the only natural stones that require absolutely no sealing or polishing. Simply wash it with warm water and use a mild soap if desired. One of the best aspects of Cambria for outdoor kitchens is that fact that it is nonporous meaning food and other organic matter can’t get into the cracks and allow potentially dangerous bacteria to grow around you and your family.